A tribute album of Celtic folk tunes dedicated to Jean Corr, the late mother of Ireland's most famous musical siblings. Approach with caution! The Cluas Verdict: 5.5 out of 10. The Corrs are not cool. They are not people who would top your list of desired drinking companions. They make music that you try hard to dislike. Yet, there is something about them that is strangely charming. Maybe it is Andrea's vocals or their song arrangements. Or maybe it's just their guilty pop tunes with a folksy twist, which you seem to know all the words to, that leave you in an admissible mood towards the foursome. Okay, okay, we won't reveal your secret fondness for them just yet. But as their latest effort 'Home' spins in your CD player or on your MP3 player, you won't be reaching for the skip button as often as you might've thought you would be. It is the type of album that catches you off guard and unexpectedly captures your attention. In recent years few Irish musicians have succeeded abroad. You can actually count them on one hand. There's U2, Damien Rice, Sinead O'Connor, Enya and The Corrs. Hailing from Dundalk, the four siblings (sisters Andrea, Sharon, Caroline and brother Jim) have sold millions of records, toured worldwide and helped to represent Irish music over the last fifteen years. No matter what your opinion may be on the band, their success speaks for itself. At the core of that success are renovations of pop tunes from the likes of Fleetwood Mac and a keen sense of identity. The Corrs have always made music that is distinctively Irish, thus constantly welding together elements of their folk influenced upbringing with a modern pop angle. 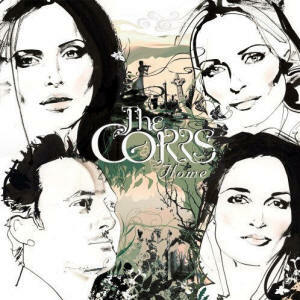 'Home' is a concept album of sorts, with the running theme being classic Irish ballads tweaked with the signature of The Corrs. Despite their efforts though, it never escapes the feeling of it being a tribute album. With the help of producer Mitchell Froom (his daughter makes up one third of power-pop group The Like), the band rooted out the old songbook that their mother Jean once sang from. They picked twelve songs that they believe perfectly evokes the spirit of their beloved mother. To add a different slant to things, they added drums, accordions and saxophone to well-known songs like 'Spaneill Hill', 'Peggy Gordon' and 'Dimming Of The Day'. The BBC Concert Orchestra were then brought in to raise the ambience on ten out of the twelve songs, but it is the four band members who are noticeable throughout. Andrea's vocals are arresting without ever being compelling, the backing harmonies from her sisters add some depth and Jim's guitar work hums at the right times. It all sails smoothly along but no one song will strike you as breathtakingly perfect. Where 'Home' suffers most is the song selection. The bold decision to take on the Phil Lynott classic 'Old Town' proves to be a disastrous one with it sounding more like a Pop Idol entry than a fitting nod to the former Thin Lizzy singer. Not focusing enough on the band's own strengths is where The Corrs let this album slip away from them. Andrea will always find it tough to match Cara Dillon on their rendition of 'Black Is The Colour' but the other band members almost shy away from getting more involved. The sense of identity that they have always taken so much pride in, suffers from the lack of imagination in these songs. In contrast to all of this, 'Home' is quite an enjoyable listen in parts but could have offered much more than it does.